Here is a collection of baking and cooking recipes using ricotta cheese as one of the ingredients. This page will be updated on regular basis. 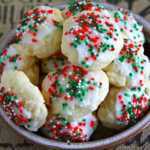 This Italian ricotta cheese cookies recipe is very easy to make, has a soft, cake-like texture. Make it special with colored icing and top it with sprinkles!